The flagship gets a full redesign and some hardware improvements, too. HMD brought a Nokia phone for all tastes to this year's MWC. Just as some people might want a retro feature phone or an entry-level smartphone, others want the best that money can buy. 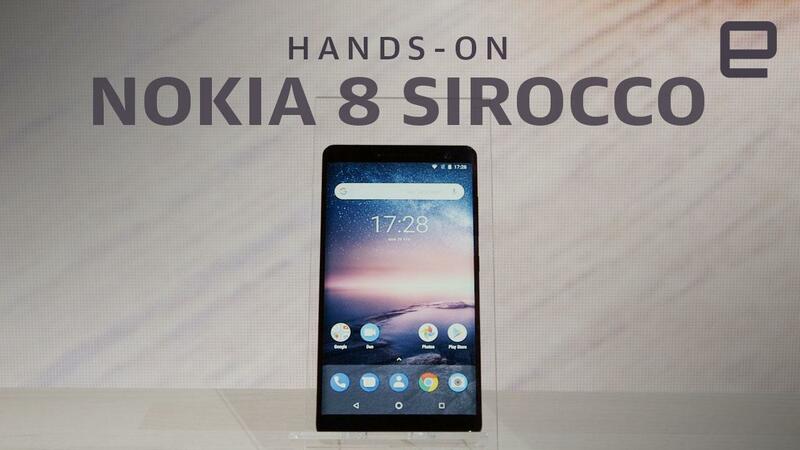 HMD's latest offering to these flagship fiends is the Nokia 8 Sirocco, which is pitched as a special edition of the Nokia 8 that launched last summer. Make no mistake, this isn't merely the same phone in a new funky color. It sports a completely overhauled design consisting almost entirely of glass. If it looks so different, why bother referring to it as a special edition and simply call it a new phone altogether? Well, HMD probably wanted to be clear that, in some ways, this is still the Nokia 8. (If you're interested, there was special Sirocco edition of the Nokia 8800 way back when, which is where the company got the name from.) Yes, it's still running Android (8.0 Oreo), and inside you'll find the same octa-core Snapdragon 835 chip, 6GB of RAM and 128 gigs of storage. But that's more or less where the similarities end. Where the Nokia 8 was splash-proof, the Sirocco edition has an IP67 water- and dust-proof rating. It now supports wireless charging and has slightly a bigger battery capacity of 3,260mAh. None of the cameras are the same, either. You still get two around the back of the device, but instead of dual 13-megapixel sensors, you're looking at one 12MP wide-angle shooter and a 13MP camera with 2x optical zoom (the new Nokia 7 Plus has the same setup). The selfie cam has taken a hit, though. It's just a 5MP affair compared to the Nokia 8's 13MP front-facer. Despite the many changes to the spec sheet, design is the major differentiator here. The Nokia 8 was pretty standard fare: glass up front, aluminum unibody everywhere else. The Sirocco edition, however, is 95-percent Gorilla Glass 5. That other five percent is the stainless steel chassis that's only exposed to the air around the perimeter -- all 2mm of it. It's a glossy, striking handset that feels great in the hand. The only downside, really, is that glass has a habit of breaking. Because the front pane of glass is now curved, there's a new flexible display to go with it. The Nokia 8's 5.3-inch LCD display has been replaced by a 5.5-inch, bendy OLED screen with the same 2,560 x 1,440 resolution. The display follows the curvature of the glass as it rounds each side to meet the stainless-steel seam -- a design choice ripped straight out of Samsung's playbook, not that we mind. Finally, the Sirocco edition looks that much neater as it does away with the physical key on the Nokia 8's bottom bezel. The only sticking point I see could be the price. When the Nokia 8 Sirocco launches in early April, it'll go for around €749 (roughly $920/£659). That's not a huge ask for a flagship phone. The iPhone 8 Plus starts at $799, and you can bet the Galaxy S9 we expect to see unveiled at MWC will be more expensive. But, considering the Nokia 8 went on sale for €599 six months ago, the Sirocco edition might look a bit too expensive for some people who value the latest bleeding-edge hardware over a funky design.